A forgotten-about entry in the golden era of early '80s Canadian tax shelter cinema – an era which produced numerous genre knock-offs of American films. While Happy Birthday to Me is no classic and barely a cult film, it’s not embarrassing and it's worth a look for fans of slasher cinema. On the campus of private school Crawford Academy one by one students from an overachieving clique of friends are disappearing without explanation. While the students are in the dark, the audience watches them get murdered in gruesome fashion by an unknown assailant identifiable only by a pair of black gloves. Who can it be? A number of red herrings try to keep us guessing. Is it Alfred, the freaky geek with a pet rat and a taxidermy collection; or Rudi, the hot-headed jealous boyfriend; or Etienne, the creepy Frenchman? Virginia (Ginny) Wainwright emerges as the hero – a girl suffering from painful memories of her mother's death and some kind of experimental brain surgery, which may have turned her into the sadistic killer. Veteran British director J. Lee Thompson (Cape Fear, Guns of Navarone) directs with some panache. Production values are top notch rendering the film completely invisible to it’s ‘Canadian-ness’, and if anything, it's a decent, stylish knock-off of Brian De Palma schlock. Bo Harwood adds an effective, classical, brooding score for even more polish. The film has more integrity than most of its '80s contemporaries. We’re actually deprived of the youthful skin and bedhopping we'd expect from having so many good looking young people in a picture. The addition of Glenn Ford adds some gravitas to the role of Ginny’s psychologist, Dr. Faraday. 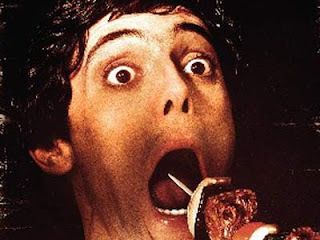 But what we’re not deprived of is a number of creative deaths, including gruesome uses of a shish kabob skewer and a bench press, in addition to the usual throat slashings. The DVD is light on extras giving us only a classic trailer to enjoy.